There were days I couldn't wait to blog about something so I could share with my online friends and fellow moms. It didn't matter that it was just a handful of people. We were community, we were friends, we got each other. No need to defend or have to explain more in detail. But then people outside the community found me....people who are not friends and things starting changing. Instead of cute and funny comments my posts started receiving angry, rude and ignorant comments. These comments...and the discussions that follow started taking away the main point of this blog. This blog is about my mothering experience. An experience I wanted to share for other mom like me. 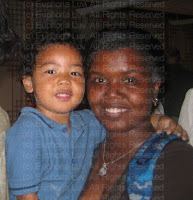 While there are tons of mom blog in the world very few are about the asian and black family. But now when I have something to blog I pause....it goes into draft mode until I can triple check to see how blog trolls are going to spin it into something negative and race focused. I no longer have the excitement and joy to share freely. While I cant get away from the race issue it's not my focus here. When people come here, hijack a post and claim I cause race drama I wonder how they missed all my other posts. Post about the funny and amazing things my son does. Posts about my fears and joys within this journey of motherhood? I've been thinking about closing down this blog. As my son grows I wonder about his privacy. At some point I need to put limits on what I share about his life. But that also goes for my life. Since my blogs have become more well know outside my community, I'm not as comfortable sharing all details of my life. There are people who visit my blog just to be nosy and learn so they can gossip behind my back. Seriously, am I that interesting? Ironically I'm caught in a catch 22 blogwise. From the comments and emails I received I know my blogs encourage other moms and even some dads. My zany stories and experiences connect with people in and out of my community. This leads to helping grow awareness. Since I can't fade into the background now what? I think slowly shifting how I write here is the answer...for now anyway. 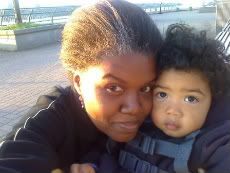 I can still tell stories about my son and parenting experiences but less about some personal things. That should be a fair solution and I can stop being in draft mode and get on with living life. 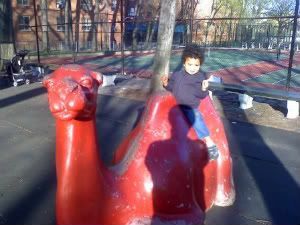 There's a camel statue in the playground. Daniel thinks it the strangest thing. 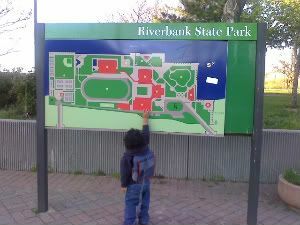 I had such a great time exploring Riverbank State park with you today. It's always wonderful to see your excitement when we go somewhere new. As I watched you discover all the things to do in the park, I thought about your dad and how today could have been different. I wondered if I cheated you somehow by not staying with your dad. My mind firmly reminds me that I did the best thing for you long term. Yet at moments like these my heart breaks when I think how much your dad is missing out...and maybe in some ways you are missing out also. 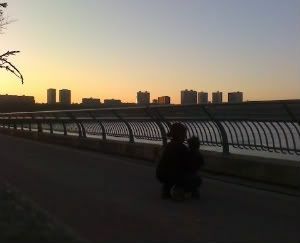 Your dad and I loved sitting in the park and watching the sun set the same way we did today. As we sit watching the sunset, I know your dad would have enjoyed spending this day with us....with you. He would have laughed, cheered and been proud at the things you did today. He would have sat with you on the grass and told you stories of his childhood. At that point I would have bopped him because his childhood stores are filled with mischief. I don't want him giving you any ideas! But still as we leave the park, only one hand holds your little one when it should have been two. Maybe one day this will change. Maybe one day your dad and I will find a way to reconnect him, you and me. Maybe. Maybe not. Either way I promise you'll always have my hand holding onto yours. The park is actually very large with lots of different area...Olympic-size pool, tennis court, track and field, and so much more. Too much for a one day adventures so we settled on just visiting the playground. On the way we made many stops so that Daniel could climb stairs, touch the grass, make friends with a a lil boy who had a scooter, flirt with that same lil boys mom and in general run around. This kid! After finally reaching the playground, it seems more for older kids but we tested it out anyway. Of course Daniel went straight to the slides. At first, I was a little nervous since it's a bit longer then the toddler slides we're use to. But after a few trips and a happy Daniel I relaxed. I even took a turn sliding down...which caused Daniel to laugh so much he nearly feel over. From there we walked back to the benches so we could watch the sun set. Of course we made more stops to explore and touch things. Finally we made it to the sitting area. As I looked at Daniel sitting nicely on a bench, I decided to take a photo of him. Of course then I needed to take a mom and son photo also. I gotta keep track of these special moments! What a full morning of tantrums. 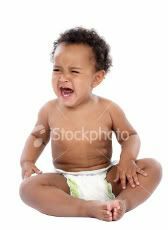 As we get closer to 2 yrs seems my son is having more meltdowns. This is a frustrating because I can't tell what sets him off. Matter of fact, I dont think he knows what sets him off either. This morning was a perfect example. The meltdown moment came while brushing my teeth. Now usually I do my morning rountine first while he decides if he wants to wake up on time or not. LOL. But today he decided he wanted to brush his teeth first. This was a problem since I was in the middle of brushing my teeth. I asked him to wait a sec. No good. Imediate crying fit. So I get his tooth brush, add a drop of tooth paste and give it to him. No good. Now he doesnt want it. As he stands wailing his anger and refusing the toothbrush...I stand there dumbstruck. Did I mention I'm still not finished brushing my own teeth? What follows is 40 minutes of me trying to calm him down but not suceeding. Eventually I decide to just let him cry it out. I've noticed that sometimes he gets into this crying zone and nothing can be done till he's ready to stop. So I continue with my morning rountine of breakfast, getting dressed, etc while he follows me around crying. I felt for my neightbors who had to hear a crying child early in the morning. Im sure they wondered what was going on because while he cried, rolled around on the floor amd threw his toys... I said not one word. Im not really interested in feeding into trantrums anyway. I rather ignore the behavior and wait till he's calmier. Eventually he stop being upset and started looking around for his breakfast. He then ate nicely and we continued with our morning. I figured everything was fine. Then we got to daycare. Apparently my son was still a bit mad at me cause when it came time to say goodbye...he refuse to. No kiss, no wave, nothing. Hmm. I guess the other children felt bad for me because they all said by to me on his behalf. They call waved and said byeeeeeee. I think one even said bye daniel's moms. LOL. Ah life with a 2yr is going to be...interesting. 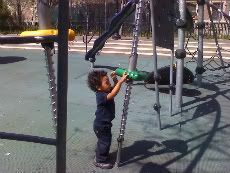 Today, as we normally do we headed to the park early to enjoy a little playtime session before starting the day. I decided to walk a different way and explore a little before going to the usual playground. On the way I discovered a new playground with all sorts of cool play areas. Of course my son was more then willing to check it out. 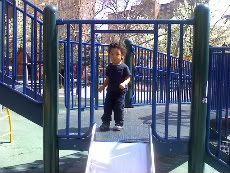 We spent about half an hour running all around the playground testing out the ramps, slide, steps and anything else that caught my son's eye. As we're playing a fun game of "tag" I notice a lady and her dog walking towards us. She starts the usual comments to Daniel...hello handsome, etc. Lady: "Where are his parents from"? Me: Huh? I'm his mother. Lady: *stuttering* Oh, Well, It's hard to know sometimes. I mean, where is his father from? Me: *giving her a look, while I take my son hand* Yeah, Well have a good day. I'm sure she said something as we left but at that point I was too pissed to pay attention. Can't I have today to just enjoy being with my son? It's Easter Sunday, shouldn't she be in church, with family or something? But what really annoyed me is that people need to ask about his father race so they can KNOW...like it's not obvious my son is mixed with some type of Asian?! I have to TELL them? WTF? 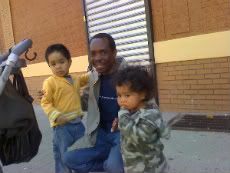 As we walked back to our area playground, where everyone knows us, I see a man and his two sons walking a bit up the block. 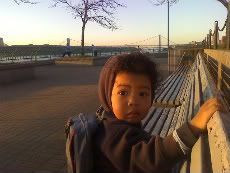 But wait...one of his son looks just like my son when he was about 1 year. Then I get a look at the other son. OMG, it's a blasian family. Now we all know I ain't the shy type. So as I walk over to him, I beam a big smile and say hello. I quickly explain that we're both parents of half Asian child and we should be friends. LOL. After getting over his shock of some strange black women stopping him randomly, the dad starts telling me about his family. His wife is Japanese and he's from South Africa. The boys are 3yrs and 1.5yrs. We stand there trading stories while taking photos of each other and the kids. For that moment we were our own little playgroup. I gave him my contact info and begged him to tell his wife to call me for a playdate. What are the odds of running into another blasian family in Harlem? Apparently pretty good odds!